There’s a new internet game making the rounds – no, not souped up versions of Jewel Blitz or Words with Friends. It’s called “Blog Tag,” and I was tagged by Donna Fletcher Crow to be “it” this week, and to write about my Next Big Thing. I actually began work on Yom Killer shortly after I finished the first draft of Unleavened Dead. I wrote three pages. Then I put it aside to revise and shop Unleavened Dead. Then I looked at those three pages, decided they didn’t work, and rewrote them. Then I auctioned and sold off naming rights for characters as a fund-raiser for Congregation Beth Tikvah (http://www.btikvah.org). I knew at that point that I was committed to getting beyond three pages – there’s no way I could introduce all the new characters in that small a space. And it would make for a very confusing and boring – and short – novel. So I reread what I had rewritten, didn’t like it, and rewrote it. And there it sits. Until now. Or soon. As soon as I finish all the guest blogs I’ve promised to write. As soon as I finish all the PR and marketing I need to do to give Unleavened Dead a good launch. As soon as real life stops interrupting what I really want to do. I’m not a planner: I don’t outline my books. I’m a pantser: I write by the seat of my pants. Of course, I have some idea what will be happening in my books, but mostly I let my characters tell me what they want to do and what is happening. In Yom Killer, I know that Aviva’s elderly mother has suffered a stroke – maybe – and has been hospitalized, despite her express, written orders that she does not want to be. And ignoring advanced directives is not the only problem Aviva uncovers at the assisted living facility her mother has called home for several years. The new owners have converted it from a non-profit to a for-profit facility, and will no longer accept residents who rely on Medicare or Medicaid (I’ll figure out which is which eventually) payments to pay their fees. And the residents who have lived there under the old rules are supposed to be “grandfathered” in, but seem to be dying in alarming numbers, even for the elderly. Of course, Aviva can’t ignore what she suspects is going on, especially when she finds out her mother (with her granddaughter’s help) had hacked into the owners’ financial records and uncovered some suspicious bookkeeping practices. And especially when a medical resident at the hospital wonders out loud why Aviva’s mother, who fell forward and hit her head on the sink, has a bruise not just on her forehead (as expected), but on the back of her head. A bruise that looks as though it could have been caused by the proverbial blunt instrument. Now it’s personal. All I have left to do is figure out how to get from Point A (the beginning) to Point Z (the end). And not have the obvious bad guy be the bad guy. But at least I know the bad guy’s name: he paid the highest amount at the character name auction. UNLEAVENED DEAD IN PRINT NOW! And don’t forget the Launch Party, Sunday, December 9, 4:30 PM, Barnes and Noble, Rte. 70, Marlton. RSVPs appreciated – we don’t want to run out of cake! I asked five authors whose works I enjoy (and whom I have met) to read the unedited manuscript of Unleavened Dead, and, if they liked the book, to write a blurb to appear on the back cover. All five accepted, and all five wrote nice mini-reviews. In order to fit all five onto the back cover (along with the book description, my bio, and my picture), we had to cut down the already short comments to a few snippets. All five have given me permission to post the full blurbs on my website/blog. Please help me thank them by clicking on the links for their websites. And, even better, read their books. You won’t be disappointed. The wait is almost over. 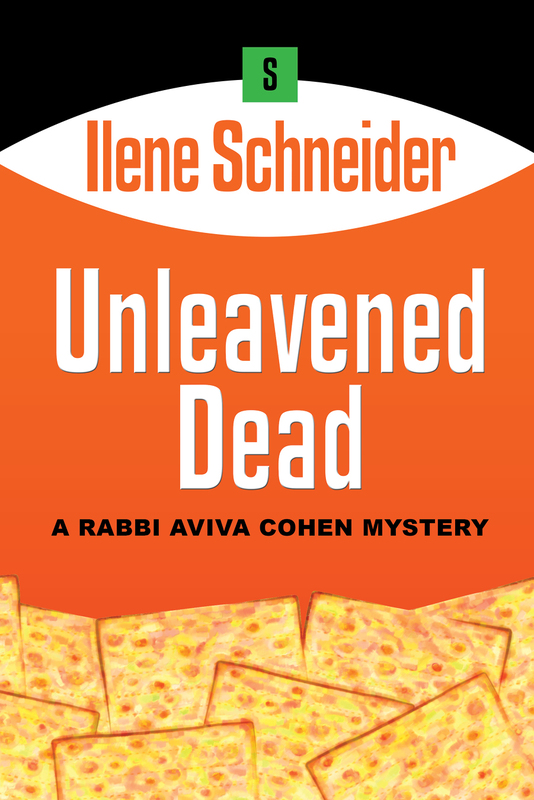 You can now pre-order UNLEAVENED DEAD, the 2nd Rabbi Aviva Cohen Mystery, from the Oak Tree Press site. Scroll down – the books are listed in alphabetical order. Buy early and often!